A member of the Executive Council of the Ghana Football Association, Kwame Ntow-Fiako, has challenged the FA’s outgoing Chairman Ben Koufie’s claim that the Executive Council is the mother of all frustrations and should therefore be scrapped. Ntow-Fiako in an interview with the Soccer Express said, as much as the FA Chairman has right to air his views on issues affecting the nation, it would be unfortunate if he provides no proof of the claims he makes. "Koufie worked with the Executive Council for the past three years and why he chose the eve of his departure to make those remarks is very interesting. He never complained during this period and he must not go away without substantiating what impediments the Council put in his way to deserve a tag such as ‘the mother of all frustrations." Koufie’s comment elicited a sharp retort from the Chairman of the Executive Council, Alhaji Y.A. Ibrahim who suggested on a radio programme that Koufie would be invited by the Council to defend his remarks. Ntow-Fiako, a lawyer and Deputy Chief Registrar of the Judicial Service, who is also a member of the Ghana League Clubs Association and the Division One League Board said the FA’s Executive Council neither came into being by accident nor was it imposed on the association, but came into existence upon the considered recommendations of well meaning interests in Ghana’s football. "We would be going back into the old days if we are to implement Mr. Koufie’s recommendation that the Management Board of the FA should be a final authority. The current structure and composition of the Executive Council was informed from a similar situation in 1990 when we had the same GFA Management Board Chairman being the Executive Council Chairman. Why should we go back to the very situation the clubs condemned some 13 years ago?" he queried. The clubs, then under the Organisation of the Ghana League Clubs Association, OGLCA, after failing with persistent calls for an extra-ordinary congress to fix problems associated with football in the country, charged that ‘Naturally an inefficient and non democratic Management Board Chairman would not readily convene a Council meeting where he is likely to be taken to task. 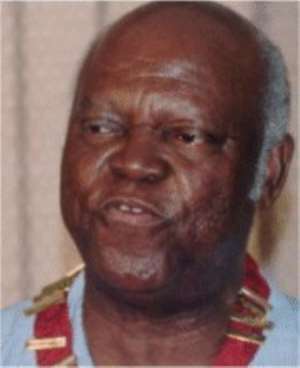 ‘The clubs believe that one person being the Chairman of the Executive Council and the Management Board is not conducive to progress within the Ghanaian cultural behaviour and practical realities.’ Ntow-Fiako said since the current structure was put in place in 1991, Awuah Nyamekye and his team worked under it without calling for its abolition, so have Nana Butler, and M.N.D. Jawula worked with the Council without any of them criticising it or complaining against it and it will do Ghana football a lot of good if Mr. Koufie would advance tangible reasons to back his call. He explained that the Executive Council is functioning as the Board of the FA and of course sees to the implementation of Congress decisions and wondered who would have been in charge of the administration of Ghana football in the recent scenario where the FA exhausted its term of office but had failed to complete its programmes in good time because of several mediating issues and needed an extension of mandate. He said the FA cannot extend its own mandate in such an instance and wondered why the FA chairman did not refuse the extended mandate of his administration by the Council. Ntow-Fiako denied any interference of the Executive Council in the affairs of the Management Board and challenged Ben Koufie to provide any instance of such a hindrance. On the contrary, he said the Council has saved the nation from several sticky situations such as was the role of the Council in resolving the Tudu Mighty Jets court case. "Was it the Executive Council decision to take the $25000 ‘gift’ in Nigeria that so scandalised the nation even to FIFA? Was it not the Executive Council rather that helped resolve the matter? Where was the hand of the Executive Council in the Charles Taylor transfer saga that nearly brought Kotoko and Hearts on knife’s edge? Was it not the sole dealing of the FA? How did the Executive Council tie the FA’s hands in the Valentine Atem case anyway? Where was the Executive Council when he signed the Crystal TV contract and how did the Council feature in the three months delayed release of the 2003 league table? Koufie should not turn the Executive Council into a punching bag and prejudice the minds of the public and the incoming administration against it. It does not pay at all." The lawyer admitted however that the Council being a human institution could have weaknesses but insisted that it would be irresponsible to chastise it without showing cause.